92 Resources Corp. (TSX-V: NTY | FSE: R9G2 | OTC: RGDCFB) is a modern energy solution company, focused on acquiring and advancing strategic and prospective modern energy-related projects. The Company currently holds four principal assets in Canada: the Corvette and Pontax lithium properties in Quebec, the Golden Frac Sand Property, BC, and the Hidden Lake Lithium Property, NWT, currently under Option Agreement to Far Resources Ltd. Additionally, the Company holds an Option from Osisko Mining Inc. for a majority interest in the FCI Property, situated directly adjacent to the Company’s wholly owned Corvette Property. Atlantic Gold Corporation is the sectors lowest cost gold producer (relative AISC amongst global junior and intermediate producers worldwide). Atlantic is focused on growing gold production in Nova Scotia, Canada beginning with its MRC phase one open pit gold mine which declared commercial production in March 2018, and its phase two Life of Mine Expansion which will ramp up gold production to +200,000 ounces per year at industry lowest quartile cash and all-in-sustaining-costs (as stated in the Company's news release dated January 19,2018 and January 29,2018). Phase 1 Life of Mine production guidance for 2018 is between 82,000-90,000 oz. gold at All-In-Sustaining-Costs (AISC) between $CAD675/oz.-$735/oz. (US$540-588/oz.) as stated in the Company's news release (January 19, 2018). Phase 2 Life of Mine Expansion will have gold production ramping up to +200,000 ounces per annum at industry lowest quartile cash costs and all-in sustaining cost (AISC) of CAD$692/oz. Au (USD$555/oz. Au) as stated in the Company's news release (January 29, 2018). The Phase 3 expansion drill programs recently completed at the Fifteen Mile Stream and Cochrane Hill deposits were designed to target extensions of mineralization and define / upgrade inferred resources not included in the 2018 PFS to measured and indicated categories. A Phase 4 corridor regional program commenced in April 2018 and will systematically explore the +45km corridor of prospective un-tested structure targeting the Atlantic model for disseminated style gold deposits amenable to open pit mining. Best in sector shareholder alignment: Board & Management own +35%. The company's planned future development of the region will be based on a central processing facility concept with staged integration of satellite deposits into the production schedule and staged capital expenditures for expansion opportunities managed with cashflow from operations at Touquoy and additional debt capacity as a long term low cost gold producer. Aurania Resources Ltd. (ARU: TSX-V; Frankfurt: 20Q; OTCQB: AUIAF) is focused on exploration for epithermal gold and porphyry copper deposits in the Jurassic Metallogenic Belt of southeastern Ecuador – an area that is home to the Shuar indigenous people. The 2,080 km2 Lost Cities – Cutucu Project was staked over the approximate location of two colonial Spanish gold mines that operated for about 40 years from the mid-1500’s. The location of the two “Lost Cities” was estimated from the study of hundreds of historic records in South American, Spanish and Vatican libraries. This project area has not been systematically explored since the cessation of the Spanish mining operations. The Cordillera de Cutucu – the area in which the historic mines are believed to lie – forms the geological extension of the Cordillera del Condor where Aurania’s Chairman and CEO, Dr. Keith Barron and his team found the Fruta del Norte gold deposit in 2006 and President, Dr. Richard Spencer and his team discovered the Mirador, San Carlos and Panantza porphyry copper deposits between 1994 and 1997.Building on social license, targets were defined through the integration of various data sets. Magnetic and radiometric data recently acquired over the project, forms a coherent base layer on which stratigraphic and structural mapping from satellite imagery are overlain, along with stream sediment geochemical data. Multiple precious metal epithermal targets, supported by blocks of high-level sinter, have been identified. Multiple porphyry targets are characterised by magnetic features and coincident stream sediment anomalies. Work is now focusing on preparing priority targets for initial scout-drilling in late 2018. Belmont Resources Inc. (TSX:V: BEA, FSE: L3L1) is a Canadian based exploration company based in Vancouver, British Columbia engaged in the acquisition, exploration and development of mineral properties for over 40 years. Belmont’s principal asset is the Kibby Basin, Nevada U.S.A. Lithium (Li) property. The Property consists of 16 x 160 acre placer mineral claims and adjoining 126 x 20 acre claims for a total land position of 5,080 acres (2,056 ha). Belmont has recently completed its 3rd hole (KB-3) to a depth of 1798 ft. (548m). Encouraging lithium drill results were encountered in sediments throughout the hole with numerous intersections assaying above 200 ppm Li, including a 100 ft. section between 1110 and 1210 ft. averaging 415 ppm with a high of 580 ppm Li; and other intersections between 1403 ft. and 1771 ft. assaying 375+ ppm Li, as well as another 580 ppm Li at 1791 ft. Based on a recently completed Quantec MT geophysics survey Belmont plans further drilling in this large robust conductor which may represent saturated sediments containing aquifers enriched with lithium. Belmont also has a 50% stake in 12,841 ha of Uranium (U3O8) properties located in Uranium City region of Northern Saskatchewan. Saskatchewan produces approximately 1/3 of the world’s uranium. Belmont and its 50% partner expended $1.97 million in acquisition and exploration expenditures on these properties and is focused on further development through joint ventures. Caledonia is gold production mining company focused on Southern Africa. Caledonia's primary asset is a 49% interest, which shall rise to 64%, in the Blanket Mine in Zimbabwe which has a guidance for 2018 of 55,000 - 59,000 ounces gold production at AISC of US$ 845 - 890/oz. The M&I Resources are at 805koz at 3.72g/ and Inferred resources of 963koz at 4.52g/t. The fully funded investment program supports a 14 year life of mine with significant on-mine and regional exploration upside. The company pays a quarterly dividend which they raised in July 2016 to 1.375 USD-Cents which is equal to 8.3 CAD-Cents and gives an annual yield around 4.5% for the share. The production shall rise by 2021 to 80,000 oz Gold and which will lead to further falling costs. As an indigenised entity, Blanket can implement its long term growth strategy. Higher dividends are likely as the majority of the capital investment program is finished by 2019. Cardinal Resources Limited (ASX/TSX: CDV) is a West African gold‐focused exploration and development Company which holds interests in tenements within Ghana, West Africa. The Company is focused on the development of the Namdini Project with a recently announced Maiden Probable Reserve of 4.76Moz and is now advancing the feasibility study supported by additional multi-disciplinary engineering activities. Exploration programmes are also underway at the Company’s Bolgatanga (Northern Ghana) and Subranum (Southern Ghana) Projects. Feasibility Study for the Namdini Project due Q3 2019. Commerce Resources Corp. (TSX V - CCE | Frankfurt - D7H | OTC - CMRZF) is a Canadian exploration and development company with a particular focus on deposits of rare metals and rare earth elements. The company has two advanced projects in Canada, namely the Ashram Rare Earth Element Deposit in Quebec and the Upper Fir Tantalum-Niobium Deposit in British Columbia. This year Commerce, in partnership with the Université Laval, successfully produced a mixed rare earth oxide concentrate from the Ashram Deposit. This represents a major milestone in Commerce's ongoing Pre-feasibility Study (PFS) for the Ashram. The company has also completed an Earn-In Agreement with Saville Resources Inc. on Commerce's Eldor Niobium Claim Group Property which is proximal to the Ashram Deposit. Saville recently completed and filed a NI 43-101 Technical Report on the Niobium Claim Group Property, where field work completed in 2017 returned samples of 4.30% Nb2O5, and they recently closed a financing raising $1.4 M CAD. CopperBank was founded in 2014 during the commodity bear market by a group of well respected entrepreneurs, geologists and engineers. The business model is to consolidate world-class copper properties and offer investors maximum optionality to higher copper prices. The established reserves and resources of our 100% controlled projects act as the asset base in this low- overhead “pounds in the ground” strategy. The Company controls three projects that are all located in the United States. Pyramid, situated near deep tide water on the Alaska Peninsula, Contact Copper that is at the pre-feasibility stage in Elko County, Nevada and the recently acquired Copper Creek project located in Pinal County, Arizona. It would take in excess of $120 Million to duplicate the work programs completed on this portfolio. With rising copper prices, the business model is shifting into the next phase as an accelerator. We aim to strategically advance each of our projects by way of accretive exploration and development, or, partnership, joint venture and monetization to provide a return to our shareholders outside of share appreciation. interest on partner funded non-core assets. Corvus’ exceptional management team has a proven track record of discovery, development and building shareholder value. at North Bullfrog in late 2014. Danakali Limited (ASX: DNK, LSE: DNK) is focused on the development of the world class Colluli Potash Project (Colluli or the Project) located in the Danakil region of Eritrea, East Africa. Colluli is the most advanced and economically attractive sulphate of potash (SOP) greenfield development project globally. Colluli comprises a world class SOP Ore Reserve of over 1.1 billion tonnes of potassium-bearing salts suitable for the production of potash fertilisers, and is 100% owned by the Colluli Mining Share Company (CMSC), a 50:50 joint venture between Danakali and the Eritrean National Mining Corporation (ENAMCO). CMSC plans to develop this large, high grade resource to its full potential through a de-risked development approach, initially focusing on the production of SOP, a premium, chloride-free, multi-nutrient potash type with limited primary production centres globally. Colluli is a shallow evaporite deposit with mineralisation starting at just 16m, making it among the shallowest SOP projects in the world. This allows for open-cut mining – a simpler, more cost and water-efficient potash mining method than the commonly used solution method for deep solid salt deposits or trench & bore method for brines. Colluli will be developed in two stages (modules). Module I will produce 472,000 tonnes per annum of SOP, with Module II ramping production up to 944,000 tonnes per annum in year six. Even with this significant level of production, the deposit is estimated to have a mine life of approximately 200 years, based on the Ore Reserve. Once project funding is secured, development to production is expected to take approximately two years. A recently completed Front End Engineering Design (FEED) study predicts that the Colluli Potash Project has industry leading capital intensity and first quartile operating costs as well as confirming that a post-tax project level NPV of US$902M could be achieved with IRR of 29.9% for Modules I & II. In June 2018, Danakali also secured future cash flow from production with the signing of the offtake agreement with leading global fertiliser producer EuroChem, who will take or pay up to 100% of Module 1 production (minimum 87%) for ten years, with an option to extend for three years. This was shortly followed by a dual listing on the London Stock Exchange in July 2018 and the appointment of DRA Global as EPCM contractor, marking important milestones in advancing the development and the project funding process. Eritrea is a stable jurisdiction which has a maturing, proven mining industry. Recently, the country has become more attractive for foreign investment since the signing of the landmark peace accord with Ethiopia as well as warming relations in the Horn of Africa. The Project has strong support from local and regional communities, with over 500 permanent jobs to be created for local people in Module I. For more information, please refer to the company website. eCobalt is an advanced-stage TSX-listed mining company traded under the symbol ECS. eCobalt is committed to providing clean cobalt products essential for the rapidly growing rechargeable battery and renewable energy sectors, made safely, responsibly and transparently in the United States. eCobalt’s Idaho Cobalt Project ("ICP"), located in East Central Idaho within the Idaho Cobalt Belt, is the only near-term, environmentally permitted primary cobalt project in the United States. It is 100% owned by the Company’s wholly owned subsidiary, Formation Capital Corporation, U.S.
For further information, please refer to the company website. 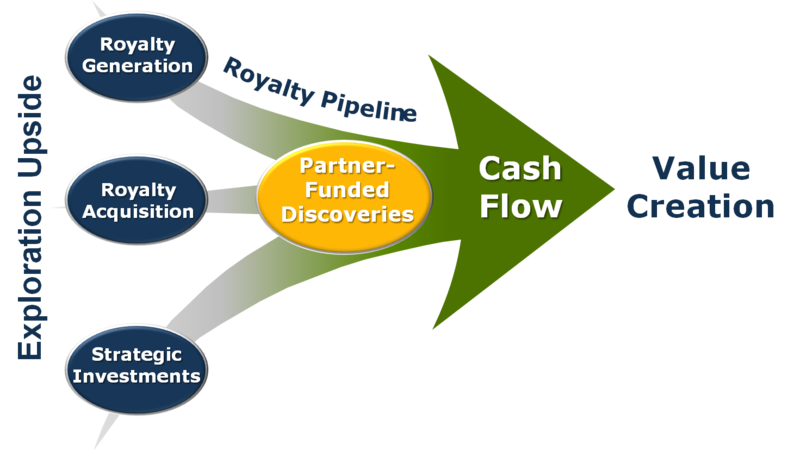 EMX Royalty Corporation has a long-standing track record of success in exploration discovery, royalty generation, royalty acquisition, and strategic investments. Our diversified, three pronged business approach provides exposure to multiple upside opportunities, while minimizing the impact on EMX's treasury. Cash flow from royalties, advance royalties, and other property payments are supplemented by returns from strategic investments, and provide "self-funding" operating capital for our ongoing business initiatives. EMX's royalty and property portfolio spans five continents, and consists of a balanced mix of precious metal, base metal, and other assets. Endeavour Silver Corp. is a mid-tier precious metals mining company listed on the NYSE:EXK and TSX:EDR. Endeavour owns four high-grade, underground, silver-gold mines in Mexico. Endeavour has a compelling pipeline of exploration and development projects to facilitate its goal to become a premier senior silver producer. The Company’s fourth mine, El Compas in Zacatecas state, will be in commercial production this year and the Terronera Project in Jalisco state is awaiting final permits and a production decision to become Endeavour’s fifth producing mine. Our philosophy of corporate social integrity creates value for all stakeholders. Excellon’s 100%-owned Platosa Mine in Durango has been Mexico’s highest-grade silver mine since production commenced in 2005. The Company is focused on optimizing the Platosa Mine’s cost and production profile, discovering further high-grade silver and carbonate replacement deposit (CRD) mineralization on the 21,000 hectare Platosa Project and epithermal silver mineralization on the 100%-owned 45,000 hectare Evolución Property and capitalizing on the opportunity in current market conditions to acquire undervalued projects in the Americas. Fireweed Zinc is a Canadian mining exploration and development company focused on advancing the Macmillan Pass Project which is host to the large Tom and Jason zinc-lead-silver deposits. Located in the Yukon Territory, Canada, the property is accessible via gravel road and by air via the Macmillan Pass Airstrip located on the property. Management’s vision is to create value for our shareholders by building Fireweed Zinc into a leading base metal development and production company through advancement and development of the Macmillan Pass Project. The Macmillan Pass Project, located in Canada's mining-friendly Yukon Territory, is host to large zinc-lead-silver deposits. The project is accessible via a 3km road from the North Canol Road off the Robert Campbell Hwy in the southeast Yukon. The territorial government is highly-supportive of the mining industry and the Yukon is one of Canada's top jurisdictions for new mine developments. First Majestic (TSX: FR | NYSE: AG | FRANKFURT: FMV) is a mining company focused on silver production in Mexico and is aggressively pursuing the development of its existing mineral property assets. The Company presently owns and operates six producing silver mines; the La Parrilla Silver Mine, the San Martin Silver Mine, the La Encantada Silver Mine, the La Guitarra Silver Mine, Del Toro Silver Mine and the Santa Elena Silver Mine . Production from these six mines is anticipated to be between 10.7 to 11.9 million ounces of pure silver or 16.8 to 18.7 million ounces of silver equivalents in 2016. The company's flagship asset is Springpole Gold Project, one of the largest undeveloped gold projects in Canada, with 4.67Moz Au in the indicated category and 0.23Moz Au in the inferred category. FYI is positioning to be a solution provider in the high purity alumina (HPA) industry by developing a fully integrated HPA processing facility. Demand for high purity alumina has gained incredible acceptance and traction globally owing to growing technological advancements and increasing demand from applications such as LED lighting, electronic displays, automotive and medical products. This trend is expected to continue with growing adoption of HPA by end users and emerging technological advancements and subsequent demand. The market for high purity alumina has witnessed tremendous growth during the past few years and is expected to grow at a compound annual growth rate of 20.5%* in terms of volume, during the analysis period. Increasing penetration of LEDs in the lighting market, newer applications of high purity alumina in smartphones, smartwatches and tablets, are significant factors driving the growth of the high purity alumina market. However, higher cost of production is expected to impede the high purity alumina market growth. GLOBEX is a Toronto Stock Exchange listed Canadian-focused exploration, royalty and development company with a very large North American portfolio of mid-stage and advanced properties with Precious Metals (gold, silver, platinum, palladium) Base Metals (copper, zinc, lead, nickel) Specialty Metals (manganese, iron, molybdenum, rare earths, titanium, vanadium, cobalt) and Industrial Metals (talc, magnesium oxide, feldspar, lithium, silica) potential. GLOBEX seeks to create shareholder value by acquiring mineral properties, enhancing them and either optioning or joint venturing them, developing them to production, or in some cases selling projects outright subject to a royalty. GoldMining Inc. is acquiring and advancing gold projects in the Americas with qualified resources in five projects in Colombia, Brazil and North America. The Company is pursuing a counter-cyclical strategy by acquiring gold projects during prolonged market downturns. Since its IPO in 2011, the Company’s share price has outperformed the TSX Venture Index, S&P 500 index, and gold mining ETFs. Gossan Resources is engaged in mineral exploration and development in Manitoba and northwestern Ontario. It has a well-diversified portfolio of properties hosting gold, platinum group and base metals, as well as the specialty and minor metals, vanadium, titanium, tantalum, lithium and chromium. The Company also has a large deposit of high-purity, magnesium-rich dolomite and various financial interests in a frac sand deposit. Gossan has acquired a new property in the zinc-rich polymetallic Sturgeon Lake Zinc Greenstone Belt in northwestern Ontario, where it recently completed a geochemical survey. Gossan trades on the TSX Venture and the Frankfurt/Freiverkehr&Xetra Exchanges and at March 20, 2017 has 33,170,400 common shares outstanding. GoviEx Uranium (TSX-V: GXU; OTCQB: GVXXF) is a growing, Africa-focused uranium company with a defined project development pipeline and strong jurisdictional diversification. GoviEx’s principal objective is to become a significant uranium producer through the continued exploration and development of its two mine-permitted projects - the Madaouela Project in Niger and the Mutanga Project in Zambia - and its exploration Falea Project in Mali. GoviEx’s investment highlights include a strong strategic shareholder base and experienced leadership. The company is supported by three leading nuclear and mining companies: Denison Mines, Cameco Corporation, and Ivanhoe Industries. The development-focused owner’s team has a wealth of uranium production and capital markets experience. On a U3O8 and an U3O8 Eq basis, GXU has one of the largest mineral resources amongst its uranium peers, with more than 230 million pounds of U3O8. Significant metallurgical test work and engineering studies completed on its assets provide GoviEx with a solid foundation on which to build when uranium prices rise. Given that uranium demand due to nuclear energy growth is forecast to increase by an average of 3% per annum, and given that worldwide uranium production looks to be declining, all predictions point to an increase in uranium prices. 1. Debt finance structuring, including engagement of various export credit agencies. 2. Project optimization and completion of detailed engineering. Great Panther Silver Limited is a primary silver mining and exploration company listed on the Toronto Stock Exchange trading under the symbol GPR, and on the NYSE American under the symbol GPL. Great Panther's current activities are focused on the mining of precious metals from its two wholly-owned operating mines in Mexico: the Guanajuato Mine Complex, which includes the San Ignacio Mine; and the Topia Mine in Durango; and advancing the development of the Coricancha Mine Complex in Peru. The Company's activities also include the pursuit of additional mining opportunities in the Americas. Powering the E-Future of tomorrow! M2Cobalt has 100% ownership in claims covering approximately 2,413.8 km2 of highly prospective land in the mineral rich country of Uganda, East Africa. Bordering the DRC, which currently produces approximately 65% of the world’s cobalt, our assets also share the same underlying geology, and are on trend with, a number of major producing mines in the DRC, Rwanda and Tanzania. Some of our key assets are also close to, and on trend with, the former producing Kilembe mine, which between the 1950’s and 1970s was Uganda's largest producing copper/ cobalt mine and which produced some of the highest grades of copper globally during that time. Mawson Resources, (TSX - MAW; Frankfurt - MRY (WKN A0B 8YJ); Pinksheets - MWSNF) is a resource acquisition and development company engaged in the acquisition & exploration of METAL and ENERGY interests in Scandinavia and Latin America. All its projects are 100% owned. The Company has distinguished itself as a leading Scandinavian gold and uranium exploration company with a focus on its flagship Rompas project in Finland, a Bonanza Gold and Uranium discovery. As the European Union moves to reduce its reliance on carbon-based energy sources and continues to debate energy security, Mawson is well positioned to provide Europe with the option to fuel its future. Mawson is a leader in uranium development in Scandinavia with +15M lbs in NI43-101 resources. In addition, the Company is exploring for gold and copper in the highly prospective Cordillera of Peru with a focus on a new Peruvian gold-copper discovery at Alto Quemado. The Pastos Grandes Lithium Project is an advanced stage development project strategically located within the “Lithium Triangle” which is host to some of the world’s largest lithium resources. The company has the option to acquire 100% of the Pastos Grandes Lithium Project in Salta Province Argentina. Merritt Mill and Tailings Facility – approximate $23,400,000 mineral processing facility located on an $8,000,000 property, and a $1,800,000 fully lined tailings facility property located near Merritt BC. Treasure Mountain Exploration Property – 100% owned high-grade silver/lead/zinc vein deposit, and the claim holdings consist of 51 mineral tenures comprising 21 legacy claims, 100 cell units and one Crown Grant for a total of approximately 2,850 hectares (7,000 acres). New Craigmont Exploration Property – comprised of 20 contiguous mineral claims covering approximately 8,456.95 ha, and 10 contiguous mining leases covering approximately 347.35 ha in the prolific Guichon Batholith region. The claims are currently owned 100% by a wholly owned subsidiary of the Company. Aggregate Operations – Company is host to an active run gravel pit that has a tolling agreement. Residential Property – the residential property is comprised of 5 residential lots totalling approximately 488.70 acres. Nordic Gold starts the gold production at the Laiva Mine in Finland end of November 2018.The Laiva deposit is located in Raahe, Finland and is one of the largest gold resources in the region. The mine is a conventional open pit mine with 2 pits. Exploration in the Laiva area started in 2005. Previously the area was worked by both Endomines Oy and Outokumpu. The operation includes two pits and a recently constructed 6,000 tpd, state-of-the-art process plant designed by Metso and constructed by Outotec. Historic expenditure on the property is estimated at €220 million. The mill and leaching plant was completed completed in 2011. Mining at the property was initiated in Q3 2011 and the first doré bar was cast in December that year.The mine has excellent access to local infrastructure, including grid power (110 kV line), paved all weather roads (within 5 km) and port (within 20 km). All mining infrastructure in currently in place and the mine is re-opened already and the first gold pour is scheduled for end of November 2018. Finland was declared as World’s 6th best country for property rights. (Forbes Dec 2016), ahead of Canada and USA. Finland has a 20% Corporate Tax rate and gold producers pay 0.15% Royalty. Osisko Gold Royalties Ltd is an intermediate precious metal royalty company focused on the Americas that commenced activities in June 2014. Following the the Orion transaction, Osisko now holds a North American focused portfolio of over 130 royalties, streams and precious metal offtakes. Osisko’s portfolio is anchored by five cornerstone assets, including a 5% NSR royalty on the Canadian Malartic, which is the largest gold mine in Canada. Osisko also owns a portfolio of publicly held resource companies, including a 15.5% interest in Osisko Mining Inc., a 33.4% interest in Barkerville Gold Mines Ltd. and a 12.7% interest in Falco Resources Ltd.
Pasinex Resources Limited is a new force in base metal mineral exploration and mining. Pasinex Resources will be building a strong base and precious metal focused company, with a particular initial priority given to building a strong portfolio of base metal opportunities. Pasinex Resources is focused on exploration in Turkey and is already actively pursuing a portfolio of properties there. Turkey is a special place to explore, offering great geology and mineral wealth, stable government committed to mineral development, a growing economy and an excellent, educated workforce. Pasinex has assembled a world class leadership team that is already working on property acquisition in Turkey. To this end Pasinex has established an office in Ankara, Turkey. Radisson is a gold exploration company based in Quebec, Canada. The O’Brien project, cut by the world-renowned Larder-Lake-Cadillac Break, is Radisson’s flagship asset. The project hosts the former O’Brien Mine, considered to have been the Abitibi Greenstone Belt’s highest-grade gold producer during its production (1,197,147 metric tons at 15.25 g/t Au for 587,121 ounces of gold from 1926 to 1957; InnovExplo, May 2018). Resolute Mining Limited (Resolute) is gold producer listed on the Australian Securities Exchange with a market capitalisation of ~A$850 million. Resolute is a successful gold miner with more than 28 years of experience as an explorer, developer, and operator of gold mines in Australia and Africa. The Company has operated nine gold mines which have produced more than 8 million ounces (oz) of gold. Resolute currently owns 3 gold mines, the Syama Gold Mine in Mali (Syama), the Ravenswood Gold Mine in Australia (Ravenswood) and the Bibiani Gold Mine in Ghana (Bibiani). For the financial year ending 30 June 2019, Resolute expects to produce 300,000oz of gold at an All-In Sustaining Cost of US$960/oz (A$1,280/oz). The Company has a pathway to annual gold production in excess of 500,000oz from a Global Mineral Resource base of 16.5 million ounces. Resolute is committed to returns to its shareholders and has a policy of paying at least 2% of its revenue as an annual dividend (FY18: 3.3% of revenue paid as a dividend). Resolute shareholders can elect to receive their dividend either in cash or in gold as part of Resolute’s collaboration with the Perth Mint. Syama is a world class, robust, long-life asset capable of producing more than 300,000ozpa of gold from existing processing infrastructure at a life-of-mine All-In Sustaining Cost of US$746/oz. Resolute is currently developing the world’s first fully automated underground gold mine at Syama which will deliver a low cost, large scale operation with a mine life beyond 2032. ​Bibiani is a potential long life, high margin operation and represents a growth opportunity for Resolute. The Company’s latest study on Bibiani projected a potential 10-year, 100,000ozpa gold mine at a life-of-mine All-In Sustaining Cost of US$764/oz. Resolute is actively exploring over 5,300km2 of potential world class tenure in Africa and Australia searching for opportunities to expand and improve the Company’s operations. A portfolio of strategic investments in highly prospective, well managed African-focused gold exploration companies (Orca Gold, Oklo Resources, Mako Gold, Loncor Resources, Kilo Goldmines and Manas Resources) has been established to provide a pipeline of future development opportunities. Rock Tech Lithium Inc. is a mineral exploration company focused on the lithium industry. Based in Vancouver and listed on the TSX Venture Exchange and the Frankfurt Stock Exchange, the Company's International Board of Directors provides a truly global presence and unique access to capital and projects. The Company is currently developing it's 100% owned Georgia Lake lithium project in Ontario, Canada, and has defined a "measured and indicated" resource of 6.57 million tonnes grading 1.01% Li2O in addition to an "inferred" resource of 6.72 million tonnes grading 1.16% Li2O. The results from a Preliminary Economic Assessment are expected shortly. Saturn’s immediate focus will be acquiring high quality, long life assets with proven production. Focusing on Saskatchewan's stable jurisdiction, Saturn will use its domain experience to evaluate properties that fall within its exploration and development criteria. Exercising fiscal prudence and maintaining a strong balance sheet will allow Saturn to maintain constant growth. Long term stability will be generated through experienced management and a strong technical team. De-risked assets and calculated execution will allow Saturn to achieve growth in reserves/production through retained earning. Saturn's portfolio will become its key to growth and provide long-term stability to shareholders. We are currently evaluating a series of low risk opportunities with significant upside potential. Saturn is driven to build a strong portfolio of cash flowing assets with strategic land positions. Saville Resources Inc. (TSX:V:SRE, FSE:SOJ) is a Canadian exploration company based in Vancouver, British Columbia, Canada. Saville maintains a strong cash position with no debt. Saville’s principal asset is the Niobium Claim Group Property, located in Quebec, where the Company currently has a work program underway delineating drill targets. The Property consists of 26 contiguous mineral claims, encompassing an area of approximately 1,223 hectares, and is considered highly prospective for niobium and tantalum. The Property includes portions of the high-priority, and drill ready, Miranna Target where prior boulder sampling in the area has returned 5.9% Nb2O5 and 1,220 ppm Ta2O5, as well as the Northwest and Southeast areas where previous drilling has returned wide intercepts of mineralization, including 0.61% Nb2O5 over 12.0 m (EC08-008) and 0.82% Nb2O5 over 21.9 m (EC10-033), respectively. Saville Resources recently received final TSX Venture Exchange approval on its Niobium Claim Group Property Exploration Earn-In Agreement with Commerce Resources Corp. (TSX:V:CCE, FSE:D7H, OTC:CMRZF) and closed a private placement for $CAD 1,446,581. Silver One Resources Inc. is a growth oriented resource company, currently focusing on three silver projects in Mexico. These properties host historical resources and a proposed exploration program on two of the properties was recently announced. All three of the properties were acquired from First Mining Finance Corp. in an all stock deal. This strategic acquisition was part of the restructuring of the company, which included a 3:1 forward stock split, new management, a name change and a C$ 2.5 million placement. First Mining Finance is now a key investor in Silver One. Steppe Gold is a precious metals exploration and development company focussed on opportunities in Mongolia. The Company owns the advanced-staged ATO Project in Mongolia, acquired in 2017 from Centerra Mongolia, a subsidiary of Centerra Gold Inc. The Company has an objective to commence production in the third quarter of 2018. Steppe Gold has also acquired an additional exploration-stage mineral property in Mongolia, the Uudam Khundii (UK) property. The company has the target to become a +150,000 ounce gold producer within 3-4 years. Production shall start latest in Q1-2019. Tudor Gold Corp. (TSX-V: TUD, Frankfurt: TUC.F) is a very promising exploration company focused on precious and base metal exploration properties in the province of British Columbia, Canada. The company has 4 properties, all located in the famous ‘Golden Triangle‘, an area that hosts multiple past producing mines, two new mines and several large world-class deposits that are approaching potential development. The Company has a 60% interest in the Electrum and Treaty Creek properties, with additional 100% owned projects, or earn-in options for the Eskay North and the Crown properties. The company’s flagship ‘Treaty Creek’ property borders on, or is within a few km of world-class projects such as the ’KSM‘ project (49,2 million ounces Gold in the M+I category) of Seabridge Gold and the ’Snowfield‘ project (25,9 million ounces Gold in M+I category) of Pretium Resources. Uranium Energy Corp is a U.S.-based uranium mining and exploration company. The Company's fully-licensed Hobson processing facility is central to all of its projects in South Texas, including the Palangana in-situ recovery (ISR) mine, the permitted Goliad ISR project and the development-stage Burke Hollow ISR project. In Wyoming, UEC controls the large, fully permitted Reno Creek ISR project. The Company's operations are managed by professionals with a recognized profile for excellence in their industry, a profile based on many decades of hands-on experience in the key facets of uranium exploration, development and mining. The White Gold District of the Yukon has seen gold discoveries of approximately 7 Million Oz since 2007. There have been major acquisitions and investments by GoldCorp, Kinross and others. White Gold Corp. owns a portfolio of 21,218 quartz claims across 34 properties, totaling 423,000 hectares (approximately 40% of the district). This makes White Gold Corp. the largest land holder in the District. The properties range from grass roots to advanced exploration projects including the flagship White Gold property with a mineral resource of 961k Indicated and 282.5k Inferred ounces of gold. The highly experienced technical and management team has a track record of multiple discoveries in the White Gold District.